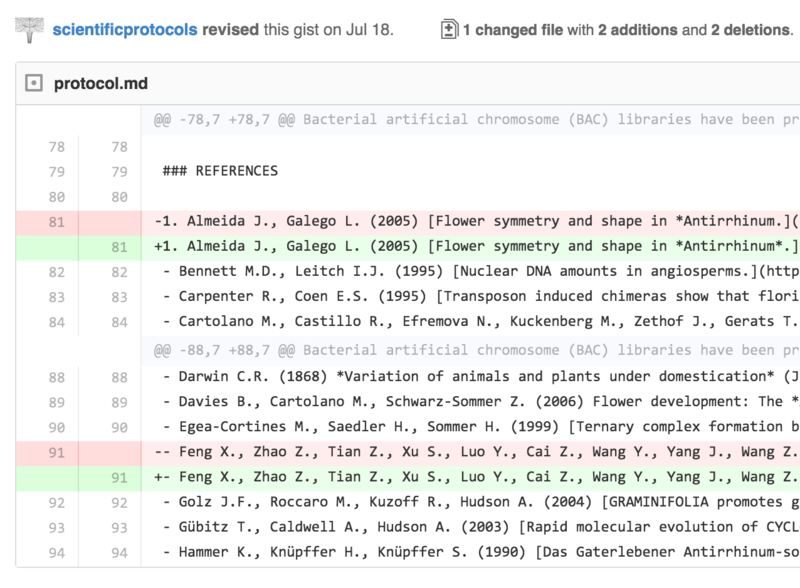 Thanks to the power of the Git version control system every change made to a protocol is tracked and can be viewed. To view changes to a protocol click the revisions button found in the right column of options when viewing the protocol. Each time a change to a protocol occurs it is stored as a revision. A revision includes a date/time stamp that the change occurred and a summary of the number of additions and deletions that happened as part of the change. In addition to the revision summary a detailed breakdown of the changes is displayed. The red line shows you what the line contained before the change was made. The green line indicates what the new contents are. If there is only red it means the line is now deleted. If there is only green it means the line is new and has just been added. It's also possible to view the entire protocol as it was at the moment a particular revision was made. In other words you can see snapshots of entire protocols throughout their lifetime rather than just the changes. To do this simply click the view gist button next to the revision you wish to view.